Here is my interview from earlier today on Press TV, it appears that the lawsuit from the families of the direct 9-11 victims will be allowed to proceed. There are millions of in-direct victims of the 9-11 False Flag attack. As everyone understands, the time for the government issued 9-11 fairy tale is over. It is past time to bring justice to the true perpetrators who are to this day walking free. America was dealt a harsh blow on 9-11, and has been in decline ever since. The only way to reverse the course we are on as a nation is to proceed with an honest and thorough investigation of the 9-11 False Flag that propelled the USA into the disastrous wars in Iraq, Afghanistan, and now Syria. The American people know we have been lied to, not just about the official 9-11 fairy tale, but about the purpose of the wars we have been involved in. There never were any weapons of mass destruction in Iraq. The Taliban was not involved in 9-11. These are all lies told to the American people and the world to justify foreign wars of aggression against peaceful Middle East Countries. The Saudis are threatening to withdraw $750 Billion dollars from the USA economy, I say let them!! The House of Saud will not last 15 minutes without the USA propping them up. If a legitimate investigation finds we have traitors within our own government, (and an honest investigation will find traitors) then it is time for some radical housekeeping among our elected officials and the bureaucrats who aided and abetted this crime against the USA and our people. It is time to hold the Saudi’s accountable for there role in spreading the Wahhabi blasphemy through out the entire world, which is the source of all radical Islamic terrorism. 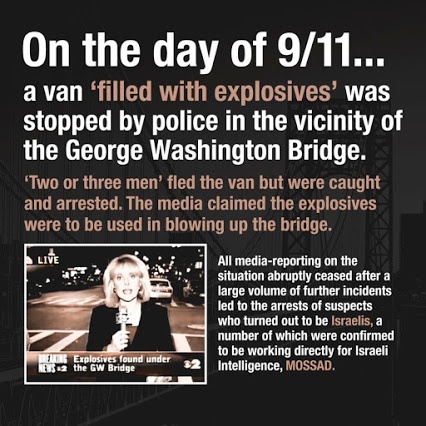 The Israeli’s need to be held accountable for their role in 9-11 as well. We know what you did, do not think you have fooled us. VT has published extensively on the rest of the 9-11 story to blow bridges and tunnels, and the fact that 9-11 was a nuclear event on USA soil.